Google (s goog) launched its fiber to the home network today and the biggest surprise is probably that the gigabit speeds are aimed at consumers only. The search giant’s fiber network, which will cost $70 for Internet only and $120 for fiber plus TV, is a killer wrapper for Google’s cloud, consumer and tablet products, some of which will be included in the fiber and TV package. Google Fiber+TV: This package includes symmetrical gigabit (the same broadband speeds on the upload and download side) speedsas well as the newly launched Google TV product, which includes local channels, integration with YouTube and Netflix as well as what Google calls “fiber channels.” It doesn’t sound like this package involves traditional pay TV channels such as ESPN or Disney. The package includes a Nexus 7 tablet, which will be used a remote control for the TV, although residents will also get a traditional Bluetooth remote control as well. Google will also release an iOS app for controlling the Google Fiber TV product on iPhones or iPads. A variety of sleek, black boxes such as a Wi-Fi router and a 2-terabyte storage box will also come with this package as well as a free terabyte of storage in Google’s cloud locker, G Drive. The total cost for this package is $120 per month and if customers sign a two-year contract Google will waive te $300 connection fee. Google Fiber: For those that don’t care for the TV package and just want a gigabit connection, there’s a package that includes the free terabyte at GDrive as well as a Wi-Fi router. This package costs $70 a month and for users who sign a 1-year contract Google will waive the $300 connection fee. Free “average” Internet: In what may be the most disruptive announcement, and is also an indication of Google’s desire to connect as many people as fast as possible to the network, it will offer 5 Mbps download speeds and 1 Mbps upload speeds for free to any household in the fiber footprint. Those homes can’t waive the construction fee, but Google will let them pay $25 a month if the sign an annual contract. OMG, when can people get this? Google has a somewhat complicated plan to determine where it will deploy the fiber. It has divided the city into “fiberhoods” with roughly 800 homes in each one. Residents of those ‘hoods will have the next six weeks to get their neighbors on board and signed up to buy Google Fiber and Google will then deploy fiber to the neighborhoods with the highest number of committed residents. It’s similar to the method Google used to select a town to deploy Google fiber, and makes a ton of sense when it comes to recouping the costs of deploying fiber. So consumers of Kansas City will get Internet access with products and services that could tremendously undercut the Internet access businesses of Time Warner Cable and AT&T, which are the dominant ISPs in the area. But businesses will have to wait. I wish we could see a list of exactly what the channels are. I reaad an article that said HBO, TNT and Time would not be available.So can we expect Showtime??? Where can I find this out? well it looks like google fiber is doing the same thing as at&t in my neighborhood bypassing the highest populated areas but if you live in the cemetery across the street you can get service i guess thats where google fiber is going into the grave yard! Are we ever going to get this in South Africa? Such backward integration from the Internet or application players makes sense. This breaks the chicken and egg problem we have with infrastructure players waiting for killer apps and app world waiting for next gen infrastructure. Lead the way google. Like Andrea said, the channel listing is up at http://fiber.google.com/plans/residential/. There are a lot of traditional pay cable TV channels listed there, but I did notice that right now some of the big names like Disney/ESPN and AMC are missing. I don’t intend to move to Kansas City. 1. What is the speed and cost of the competing services in Kansas City? 2. What kind of financial information does Google plan on sharing about this initiative? Demonstrating the financial viability of offering Gigabit service at affordable rates is one of the main objectives of this project, I hope. 3. What kind of tools and support is Google providing the residents to help drum up interest in their neighborhoods? I don’t think they should just sit back and wait for the residents of the fiberhoods to encourage their neighbors to enroll. They should also give them some tools and support. Use social media, viral campaigns, TV/radio ads, mailers, etc. On No. 1 the speeds AT&T TWC offer depend on where you live. AT&T offers DSL and U-Verse which can range from 1.5 Mbps for low-end DSL and up to 24 Mbps for the fastest U-verse. TWC offers speeds up to 50 Mbps. No. 3: Google has a physical location where residents can go to see and learn about the benefits of a gig connection. Not sure about the marketing support, the company has tended to shy away from those types of marketing efforts. On No. 3 – Google shouldn’t take their usual approach to marketing here. Some good Google initiatives in the past have not seen adoption due to poor or non-existent marketing. In today’s urban areas, people are not well-equipped and well-connected to drum up support in their neighborhoods. Especially for something like a new broadband Internet service. If people have just 6 weeks to get a high percentage of the 800 households in each fiberhood interested in this service, Google should lend them some support. What will Google do if most of the neighborhoods have just 50-100 people expressing interest in this service? > Look to the Google SEC filings. That’s not enough. Specifically looking for what kind of costs Google incurred in building the Gigabit network, what kind of revenues it makes, profits, etc. Those details are not always broken out in SEC filings. For example, for years, Google has been able to avoid providing all the monetary details about it’s Youtube business. That’s okay in case of Youtube. In the case of the Gigabit Internet service, the financial information Google shares will be crucial in evaluating other ISPs and their claims about why they are not doing better. That is what Google relied on in the past for some of its other services, which did not gain traction fast enough and had to be closed down. If Google does the same thing in this case and it finds out that only about 50 people are interested in this service in each fiberhood, that won’t be good. Even something as basic as displaying a small clickable link on the Google homepage for Internet users in Kansas City could be a ‘tool’ that helps gain greater traction. (sniff sniff) What do I smell? Oh, yeah a new delivery paradigm! I think cable operators and conventional ISP’s better be strategizing on how to beg customers not to abandon them in droves, wherever Google shows up! Bring it Google and you got an INSTANT market no matter where you roll out! That Means 5 year contracts for cheaper services. Businesses in Kansas City have already had access to dark fiber networks. I live in Kansas City and I can’t even pre-register to get this in my neighborhood, this is silly. 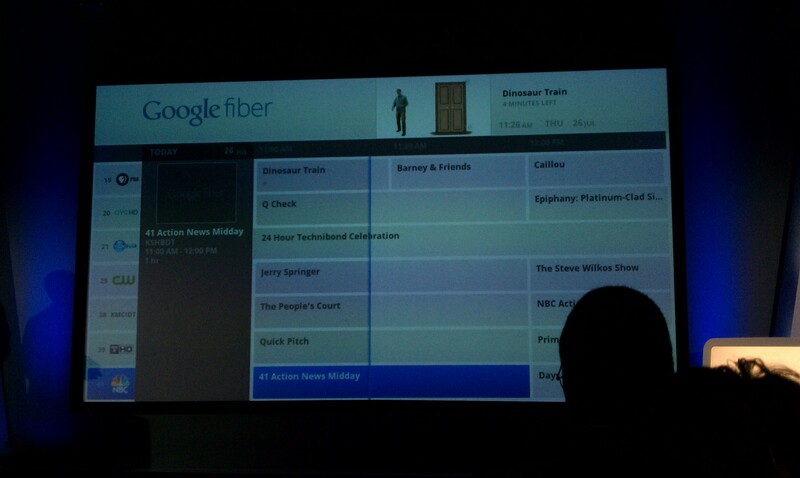 The list of channels is on the Google Fiber site. It includes pretty much every chanel I have ever heard of, and lots more. I don’t have kids so I don’t know or care about those channels. Lucky! Come to NYC soon. I have 200 Mbps at home and it is pretty damn sweet. I love it.